Zenith has pioneered many improvements in design of Calender machine, which have resulted in products of improved quality and economy of production. Calenders are made in a wide range of sizes, from small laboratory unit to the big production machines. They are furnished with two, three, four or more rolls and with rolls in different arrangements. Calenders of all sizes are incorporated with the latest features for obtaining uniform coating and sheet thickness, better productivity and processing of rubber. Machine Size of Roll Dia x Lenght Line Speed Per Minute (App.) in Mtrs. Max. Width of Product Electric Motor H.P. BED PLATE The basic bed is steel fabricated, machined to a single frame on which whole machine with Gear Box and Motor are fitted. No deep foundations are required. SAND & CAPS (WEB) Well designed for load bearing under extreme working conditions, A Grade casting /steel fabricated. ROLLS OF CALENDER The rolls are made of chilled Alloy cast iron. The rolls are hollow in centre for efficient cooling/ heating. NIP ADJUSTMENT Nip adjustment can be manual or motorized. JOURNAL BOX & BUSHES Journal Boxes are made of graded cast iron and Bushes are of Gunmetal / Phosphorus Bronze. 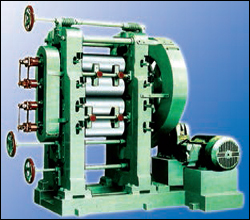 REDUCTION GEAR BOX Worm reduction gearboxes are of appropriate specification ratio. NOTE : Technological improvement may result in change of specification.